Taking to the skies on 6 February, the new route is the longest non-stop commercial flight currently in operation, with a Boeing 777-200LR carrying out the inaugural flight from Doha to Auckland on New Zealand’s North Island; a flight that was scheduled to coincide with Waitangi Day. Covering a total of 14,535km, the flight takes around 17 hours and 30 minutes, although the first plane was able to land to great celebration ahead of schedule and was welcomed with a traditional water salute. Qatar Airways Group Chief Executive, His Excellency Mr. Akbar Al Baker travelled on board the inaugural flight from Doha to Auckland and was welcomed by The Hon Todd McClay, New Zealand’s Minister of Trade and State Owned Enterprises; and Auckland Airport Chief Executive, Mr. Adrian Littlewood. “The launch of our new service to Auckland is an important milestone for Qatar Airways as we expand both in the region and globally across our network,” H.E. Mr. Al Baker said, “providing more options and better connections to exciting business and leisure destinations in Europe and the Middle East. 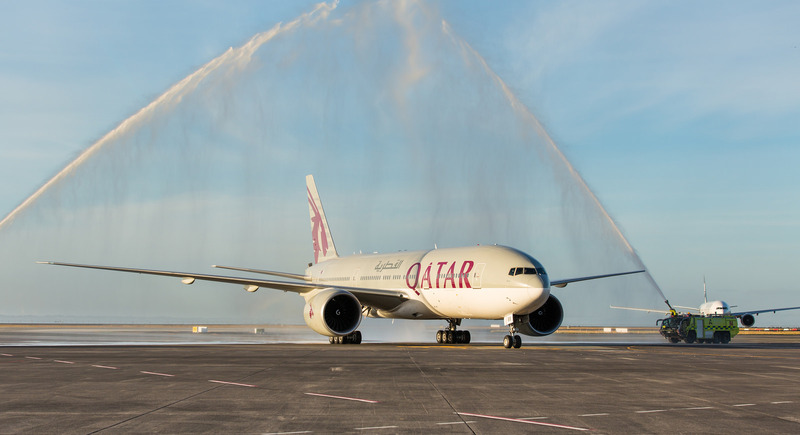 Auckland is the first city in New Zealand to be served by Qatar Airways, which added 14 new destinations last year and has more to come over the course of 2017. I am trying to think of the longest flight I have taken non stop. It must be Singapore. I think that was just over 13 hours and in economy and I was so fed up. I just can't imagine 17 and a half hours in economy- or even business! I think you need to stretch your legs and so a short connection somewhere would be better. When we went to Bali- we did an overnight in Singapore both ways. So who would take the non stop flight? Not me !! Cape Town to London was purgatory in cattle class -and that was only just over 12 hours !! Only way I could manage a long flight like that ,is if I could afford the business class/first class upgrade. I couldn't do it either. I'd be bored ridged, & stiff as a board ha ha. It would drive me crackers being stuck in my seat for that length of time. We do 4.5hr flights and that's enough for me. I'd do it if I could be zonked out for the whole trip! qatar airways, great service again!